I thought after visiting New Zealand we'd just hop over to Australia on a leisurely ferry ride. I am not kidding. And, after watching a few YouTube videos of candid questions put to Americans about this part of the world, I am not alone in thinking they were right next door to each other. That doesn't excuse my geo-gaff but it did give me some comfort. The first time I fully understood the distance was when Michael, our Chief-Travel-Planner shared our Paris, France to Auckland, New Zealand itinerary. Included in this 36-hour slog from point A to point B was a 3+ hour flight from Sydney to Auckland. What? And so my lessons on the distance and the differences between this down-under duo began. We did further research last night in "prep" for this "bloggo". But my number one (and favorite) difference between Australia and anywhere, not just New Zealand, would be the shortening of any possible word. Most often with "o" or "ie". A sick day becomes a "sickie" and to take one would be to "chuck one". How about "avro" for an afternoon? Not to confused with "avo" for avocado. And if you are going to the beach, don’t forget to fill up the "ute" at the "servo", grab your “swimmers” and your “sunnies”, and stop at the “bottle-o” for some “brewskies”. You can keep them cold in the Esky (I prefer the Kiwi's "chilly bin"). Here' a great link to 25 Awesome Australian Slang terms that we should all adopt. 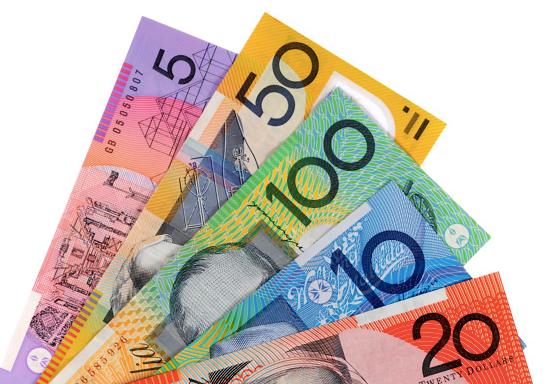 Pay for your "brekkie" at Macca's (MacDonald's) with a pineapple (50), a lobster (20) or a prawn (5). The money is as colorful as the language! Australia wins for the cutest animals and the most deadly. New Zealand doesn’t really have many four-legged creatures beyond cattle, and virtually nothing venomous. Although, from experience, their sand flys are no fun at all. Both countries have a large contingent of birdlife. There are some lovely species that sing, but most Aussie birds tend to screech and squawk and don’t think twice about stealing your dinner. We were having a beachside picnic with new friends in Sydney when a kookaburra swooped in Kamikaze-style and with great precision plucked an entire piece of fish right out of Peter's hand. A few seconds later his feathered partner-in-crime stole away with Amanda’s calamari! Of course, Australia is the size of the entire lower 48 with a population just a little larger than Florida's, while New Zealand is the size of Colorado with a population of 4.5 million. Both are filled with the friendliest, happiest sort-of-English-speaking people we’ve ever met. If you want an instant “mate” come on down to this part of the world. We began our 5 weeks in Australia in Melbourne, arriving from Christchurch on China Air. That is the 40th different airline we’ve flown since leaving Seattle in July of 2103 on Icelandair. Just like in New Zealand, we were challenged in our Airbnb search, mostly due to it being the last month of summer here, but we ended up with two really wonderful places in completely different settings. The beautiful loft we shared with our hosts in Melbourne was in the very center of town. Our first four nights were spent in a private room in a home as opposed to the entire house. The listing turned out to be a really cool converted fashion warehouse on Flinder’s Lane. We didn’t realize just how special that address was until we discovered we were in the absolute center of the city. Our hosts Bronwyn and Michael were absolutely delightful. They are about our ages and we found many things to keep us chatting over the breakfast laid out on the counter each morning. They even prepared a lovely birthday dinner for me that included a delicious selection of cupcakes. Our hosts prepared a lovely birthday dinner for me that included wicked little cupcakes. The highlight for me was joining Bronwyn (shortened to “Bronnie” of course) for a day of volunteering in the kitchen at the Asylum Seekers Resource Center. Each day a group of 6 to 8 women cook a full lunch for up to 250 refugees and volunteers. Bronwyn organizes the Tuesday Team and I got to tag along. We arrived at 9:30 for a quick prep meeting over coffee and then hit the pots, the pans, and the peelers. Whisking up some dressing for my mountains of bean salad. I discovered pomegranate syrup added just the zip I was looking for. Bronnie and the team in full-swing. Creating lunch for over 200 volunteers and refugees in just three hours was impressive - and fun! My rookie assignment was to chop giant piles of zucchini, peppers, pumpkin, and onions. I passed witih flying colors and was honored with the task of making enough bean salad for an army. By 12:30 a hot lunch of curry, pasta baked with cheese and tomatoes, crisp pork belly, mounds of rice, roasted root vegetables, two salads, fruit, bread, and as a bonus, a giant wheel of oozy camembert that had just arrived as a donation was all set up on two long buffet tables. Michael and I did our usual free walking tour of the city, but this one was quite different from others we have taken. It was called a “Greeters Tour” and it is offered through the Tourism Office. Volunteers take just 4 guests at a time on an extensive, personalized walk through the city center, that in our case lasted nearly 4 hours! Because of the small numbers, you have to book the tours well in advance, so we especially appreciated Bronwyn reserving a spot for us. Our guide was a sprightly 76-year-old gentleman that gives the Wednesday tour each week. We had to work at keeping up with him as he led us down many of Melbourne's famous laneways, up stairs, into arcades, through the State Library, and into some magnificent restored buildings. Thankfully we took a coffee break in what he touted was the smallest (and one of the oldest) coffee shops in the city. He was probably right as only 6 people could sit down at a time. Finishing up our extensive walk through Melbourne CBD with John. If you are heading to Melbourne book a free greeters tour in advance, it's well worth it! 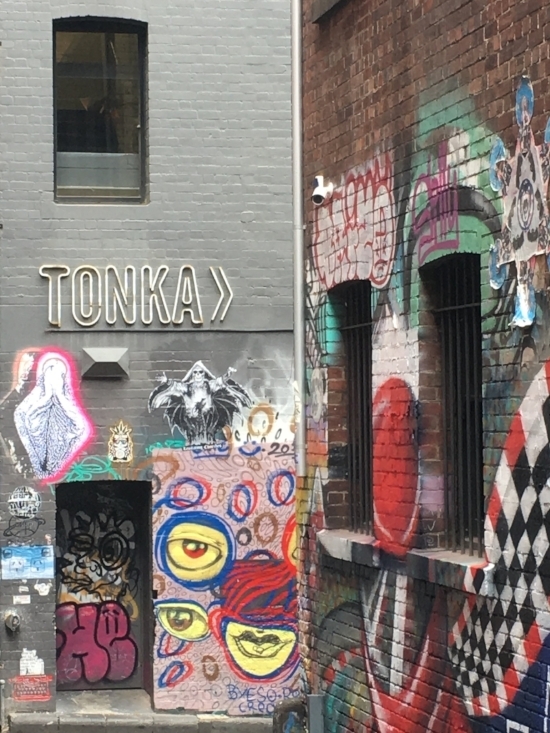 Some of Melbourne's famous laneways were dedicated to street art. Others to food. And many just to the pursuit of finding that perfect cup of coffee. All the shops are small - but this one caught my eye because of all the offerings that would somehow come out of a space the size of a one car garage. Our next Airbnb was an entire apartment in a four-unit art deco building. It was a very enjoyable 30-minute walk from the city center along the river in an area called South Yarra. 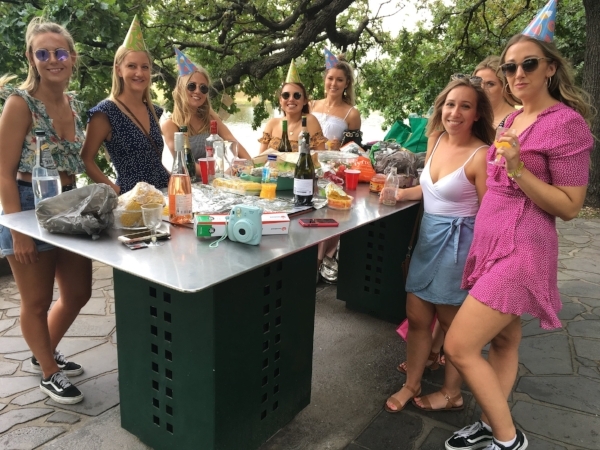 We didn’t mind getting our 10,000+ steps in each day whether it was walking downtown or through the botanical gardens nearby, or up the hill to the fabulous Prahran market, or just across the river where all the major sporting venues are. Michael ended up attending a Rugby Union match one night and toured the hallowed Melbourne Cricket Grounds also known as "The G"another day. It was a perfect location. After spending a week in this apartment we thought it was just about the right size for life after travel. Especially if we found something in a walkable area on a bus line like this was. The apartment was a nicely decorated, comfortable one bedroom + one bath with a decent sized kitchen and a small deck. The more we stay in small places, the more we realize we don’t really need a lot of square footage. Two bedrooms and two baths with a patch of outdoor living space would be fine. Where that might be is still TBD. Along the river walk into the city we spotted dozens of these free BBQ stands. You just push the propane button and you have up to 45 minutes of cooking time. These party girls had finished their grilled veggies and were on the to the good stuff. We were impressed with how clean the sites were and the mix of people using them. We passed a Turkish family grilling kebabs, Japanese students grilling fish, and a kid's soccer team celebrating with burgers. Beyond making friends with Bronwyn and Michael, we connected with an Australian couple who we’d met in Seattle a couple of years ago at a party at our good friend, Cliff Webster’s house. We met for lunch at a very popular restaurant serving contemporary Indian cuisine called Tonka. It was very stylish and not for the faint of wallet. Michael and I had looked at the menu online and made some decisions about what we might order and still stay on budget. When we arrived Mark and Nat were already seated and greeted us like old friends. We were just beginning to get reacquainted when the server arrived - Mark looked up and said: “Why don’t you just bring us whatever you think we’d enjoy!” “How long do you have for lunch?” she said. “Oh, a couple of hours” he replied. They ordered wine and well … there went the budget. But hey, we rarely splurge like this, so we clinked our glasses and settled in for a memorable afternoon. Many laneways were covered in street art including this one on the way to Tonka. Turn right at the eyeballs. Perfectly charred Chicken Tikka - part of a long leisurely lunch at Tonka. Altogether we had 6 different courses of shareable dishes that ranged from weird to wonderful. Everyone one of them was beautifully presented and delicious. The Chicken Tikka was amazing. Here’s the link to the restaurant and the interesting menu. Mark insisted on picking up the tab which was very heavy I am sure. Just another example of Aussie hospitality. On top of that, Mark arranged for the two of them to attend a rugby league match a few nights later. Our good Seattle friend Lisa Samuelson is from Melbourne and she loaded us up with great insider suggestions of things to see and do. We did our best to get through them all, but the two weeks went by so quickly! I could write about this city forever, but in the interest of getting to Canberra and Sydney, I will just give you a few other highlights of our stay: A ferry ride through the harbor to Williamstown, stopping just long enough for Gelato before the return trip. A day at the annual Moomba festival on the river by our house, including the quirky parade and the Birdman Rally where contestants try to fly across the river in their human-powered contraptions. A day at the famous Queen Victoria Market where I had a bowlful of NZ’s huge green-lipped mussels. A stroll through the National Gallery of Victoria, And a rousing rock-concert-style church service at Hillsong. And finally, a stop at a traveling exhibition called The Art of Hermes where we watched craftsman silkscreen scarves, hand stitch gloves, create signature handbags, set gemstones, paint porcelain, assemble watches and even make a saddle! It was fascinating and certainly gave us a new appreciation for what goes into creating these iconic accessories. And why they are priced accordingly. We learned it takes two years from inception to completion to create a Hermes scarf. Here an artist adds the second of 18 different colors to the silk on this complex design. 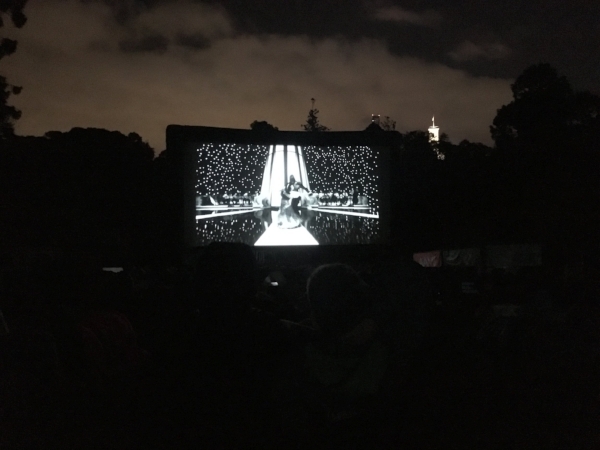 Watching The Shape of Water under the stars in the Botanical Gardens was perfect. Michael and I had some "apart time" as well. On a warm summer's evening, I watched The Shape of Water under the stars (and crow-sized bats!) in the nearby Botanical Gardens. The perfect setting for that very strange film, while Mr. Campbell was enjoying his rugby match. Michael and his volunteer tour guide at the MCG. She is sporting her coveted member's blazer and has been giving tours of this venerable club for 27 years. A perfect end to a day at the beach in the offbeat enclave of St. Kilda. And we did it all under sunny skies. I could get used to life down under! Our next stop would be Canberra. Pronounced CAN-brrrrrraa. The capital of Australia and to most Aussies not worth the visit. But not only did we have yet more new friends waiting for us there, we did some pretty amazing things. I’ll catch you up on that visit and our trip down The Great Ocean Road next time. p.s. We've left Singapore and are currently in Malacca, Malaysia. From here we'll stop in Kuala Lumpur, and Georgetown before heading to Thailand.